Here you will find information concerning our church and its ministries. We are a church that is located in the heart of the city with a heart for the city! We are driven by a commitment to become and develop fully devoted followers of Christ. We hope you find your time spent here a blessing. Feel free to browse through the various areas of our website and learn about our fellowship. If you are considering a new place of worship or a relocation to our area, we would love to have you be our guest. Here at First Baptist we are more than a church we are family! Going Vertical In Faith is the title of our church building campaign! We have now completed the work on our new 6,000 square foot building which adds a meeting space for about 200 people around tables for meals and events. A large kitchen and new restrooms are also features of this new building. We also finished a new welcome area/ gathering spot, approx. 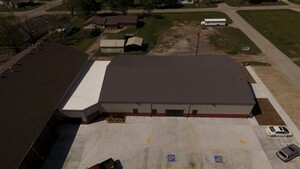 1800 square feet, which connects the existing church with the new fellowship building. A new playground has been installed and we still have plans to add other outdoor recreation items and do some remodel done to existing buildings. Thank you for praying with us as we strive to honor the Lord by Going Vertical In Faith!